There was once a time when the best stealth games would come out seemingly one after the other, which was just a part of the industry following what people wanted. If you’re sick of battle royale games, don’t worry, because they will eventually die out — it’s just the nature of the gaming climate to chase what’s hot. Just look at what’s happened to cover shooters and survival games over the years. It doesn’t feel like the stealth genre is on the way out, rather that it’s difficult to find a “straight” stealth title that isn’t interspersed with other conventions, like an open-world or open approach that gives the player plenty of choice on how to approach obstacles. This isn’t necessarily a bad thing — adaptation and evolution is part of why Mario is still as beloved as ever. The stealth games you’ll find below, however, lean more towards being pure sneaking and strategy over running and gunning. A couple of qualifiers for this list of the best stealth games: it’s in no particular order and we’ve limited ourselves to just one entry per franchise for the sake of variety. 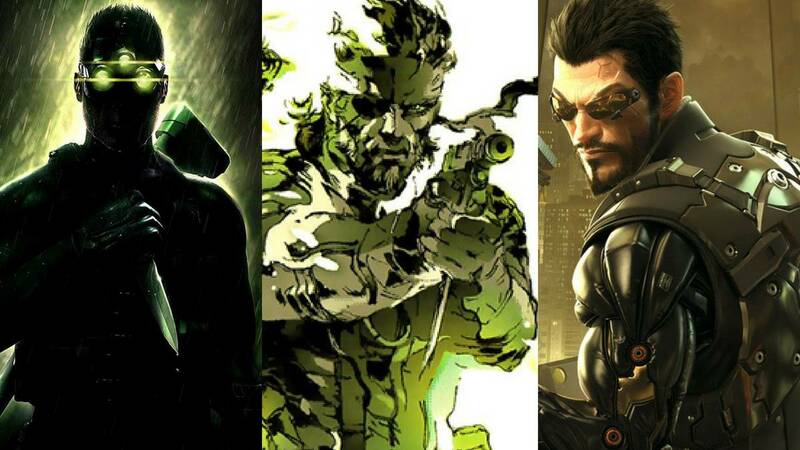 If this list of the best stealth games was ranked, Snake Eater would be sitting pretty on top of the pile. By stretching the tech limitations of its generation of gaming to almost breaking point, Kojima and co. were able to create one of gaming’s most adored franchises with its zenith. Considering the calibre of almost everything with the Metal Gear name, that’s high praise. Praise, however, that is deserved. You play as Naked Snake, who is deep behind enemy lines during the Cold War in a tale of love, loss, and bullets. To survive, he must sneak around the dense jungles with a wide variety of camouflages and nibble on his fair share of crocodile. It also has the staple Kojima attention to detail with the boss battle with The End totally avoidable if you just change your PS2’s date settings to make him die of old age. You want it, I want it, everyone wants it. The only problem with a new Splinter Cell game is that we’d have to buy it and, judging from the franchise’s most recent entries in terms of sales, it might be a risk that Ubisoft are averse to taking. If they were to make a new Splinter Cell game and have it be a success, all they need to do is look at Chaos Theory: the third entry in the series. A considerable step up on the first two games, Chaos Theory came out in a head-to-head with Solid Snake; a rivalry that was fondly remembered with an Easter egg in Ghost Recon Wildlands. Of all the games on this list, Chaos Theory may be the purest in terms of stealth. It will punish your simple mistakes with its relentless AI, so you will not just be able to light up all witnesses with a hail of gunfire. If you’ll excuse me, I have a letter to draft to Ubisoft. For one reason or another, Dishonored 2 didn’t sell like it should have, much like many of Bethesda’s single-player games of late. Whether it’s down to its laughably inadequate PC version or it just not having that many reviews at a time when Bethesda were refusing to send out earlier review copies, it wasn’t a flop, but it wasn’t a huge success, either. It’s a damn shame, too, because anyone who’s played the original game will find that Dishonored 2 fixes the annoying quirks and adds a few new ideas of its own. It heavily promotes stealth over other, more straightforward tactics, so whether you’re blinking to rooftops or summoning rats, you can feel like a superpowered assassin. If you couldn’t guess already, it feels awesome. Dishonored 2 is also one of those games that rewards experimentation and perfection, so take your time with it and you will take a lot away from it in turn. Not the original Hitman game, which is looking ropier with each passing year, but the episodic “reboot” of 2016. Released during a time when dripfeeding content was all the rage in the industry, Hitman was one of the few that actually went about it the right way, releasing new levels with tonnes of replayability and special side distractions to keep you coming until the next batch of content was ready. It doesn’t hurt that it offers the best gameplay in the series, either. Hitman had always been somewhat clunky by nature, seemingly to dissuade mass murder sprees. 2016’s Hitman, however, introduces the smoothest action seen yet with competent AI and reactive scenarios to still bring the challenge. It’s absolutely worth picking up if you haven’t yet, but its sequel ain’t too shabby, either. Of all the stealth games on this list, Styx is perhaps the most unrefined; a AA title with aspirations that it can’t quite reach. Its rough edges don’t detract from what a gem it is, though, a throwback to its inspirations of old where stealth was key to winning the day. As a sarcastic little goblin, your abilities are obviously limited — there’s no flitting over buildings in this game. This means that Shards of Darkness contains plenty of trial and error gameplay, which may frustrate some. For anyone who’s played an old-school stealth game, however, it’s a joy. The first Styx game is similarly brilliant, but for featuring refinements in controls, bigger stakes, and a somehow even more lovably obnoxious protagonist, Shards of Darkness is the one you should be checking out. No matter your thoughts on Wrath of Heaven beating out many of its siblings to be the Tenchu game included here, there’s no denying that its box art is a thing of wonder. It’s exactly what drew me to the game as a kid with its brutal style ensuring I kept coming back for more. This may be just the rose-tinted spectacles talking, but no game has matched Wrath of Heaven in terms of visceral executions. Featuring spine-breaks, heart filleting, and even some old-fashioned decapitations, it could be easy to discount Wrath of Heaven as nothing more than a gorefest, but that couldn’t be further from the truth. It requires a lot of strategy and forward planning, almost like the Hitman of ninja games — you’ll never be able to look at a rice ball the same way again. The series has been sadly dormant for almost a decade and has mainly been found on just consoles, so you may want to start scouring eBay. From Tenchu itself to a game inspired by the iconic series, Aragami is one of this generation’s most underrated games and another throwback to when stealth meant stealth. By mixing cel-shading with a unique “inky” aesthetic, Aragami certainly looks the part and it’s luckily the same story in the gameplay department. Thanks to you only being able to dispose of enemies when hidden, it’s tough, but nothing worth having — including feeling like a badass — should come easy. Aragami’s main hook is how it empowers you through the shadows with its stealth mechanics, not unlike similarly underrated The Darkness. While cloaked, you gain special abilities to help you take down your diligently patrolling enemies. Aragami rewards patience, and so should you reward yourself by picking up this often overlooked gem. It has also recently introduced co-op, so there isn’t a better time to dive into Aragami. Vampyr and What Remains of Edith Finch are some big highlights here.